When access is important but footprint space is tight, a crossover with ladder ends is often the perfect solution. A vertical climb crossover takes up very little floor space, yet enables workers to get over conveyors, mechanical equipment and pipe runs. Get the benefit of modular construction and the flexibility to reconfigure as space needs and facility layouts change - all while allowing you important access over conveyors, pipelines and other equipment that obstructs easy movement in your facility. Save floor space and still get stair access with a U-shape crossover. Sturdy steel construction and 45-degree stair angle means these crossovers give you access over conveyors, mechanical equipment, pipelines and similar obstructions with an easy climb. 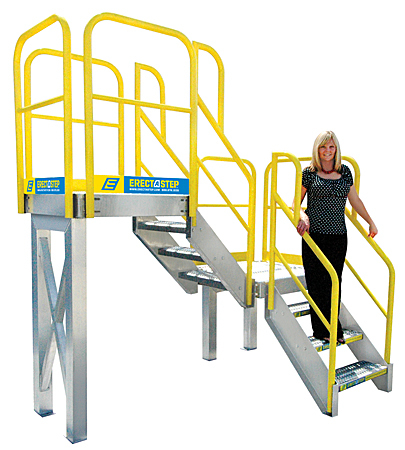 Access important areas of your facility that are obstructed by conveyor, mechanical equipment or pipeline, and other obstacles with a welded steel crossover that includes stairs and decking to take workers where they need to go faster and easier. Crossovers come in many configurations and materials. Typically, welded steel is used for crossovers that come in standard straight, U-shaped, and with ladders. There are also modular crossovers, generally made of a lighter weight material such as aluminum. Each has its advantages. Welded steel crossovers are very durable and have high weight capacities, but are often difficult to move once installed due to their one-piece construction. Some welded steel crossovers may arrive in two or three pieces for shipping purposes, and may be broken back down for ease of re-locating. Modular crossovers may not have the same weight capacities as steel crossovers, but they do have the advantage of being lightweight and modular in design. This means the modules can be taken apart and reconfigured to meet new needs as well as being easy to transport to new locations. Your choice of crossover will depend on the kind of use, size of work platform needed and likelihood of needing to move or reconfigure based on changing production flow.